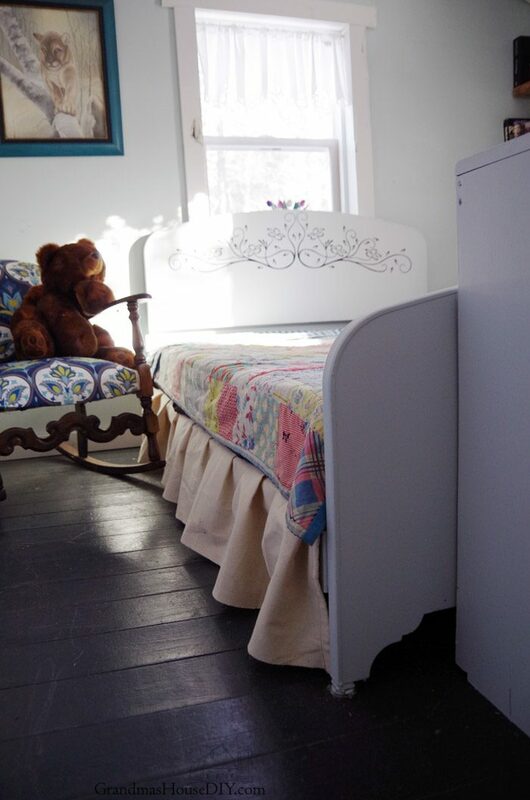 An old steel bed frame becomes a girly country dream! With my newly single life here at Grandma’s House I’ve been keeping busy and finding fun projects to look forward to. I always hated the colors I painted the furniture in my guest bedroom so I knew it was time for a change. I brought them back into more my taste starting with the old steel bed I inherited from my grandparents. I also got on the move with everything by converting my old office into my new guest bedroom and library! 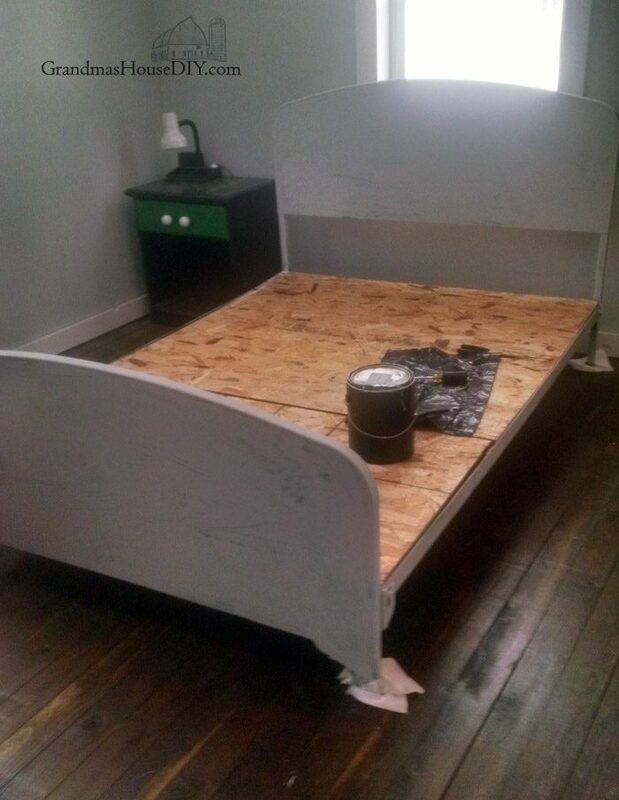 I can’t even begin to express how much I enjoyed getting rid of that horrible john deer green on this old bed! First thing was first I used a good metal primer and then I used a light gray acrylic paint to cover that up, it took several good coats and, because I’m working upstairs and inside my house now, I couldn’t spray it on. 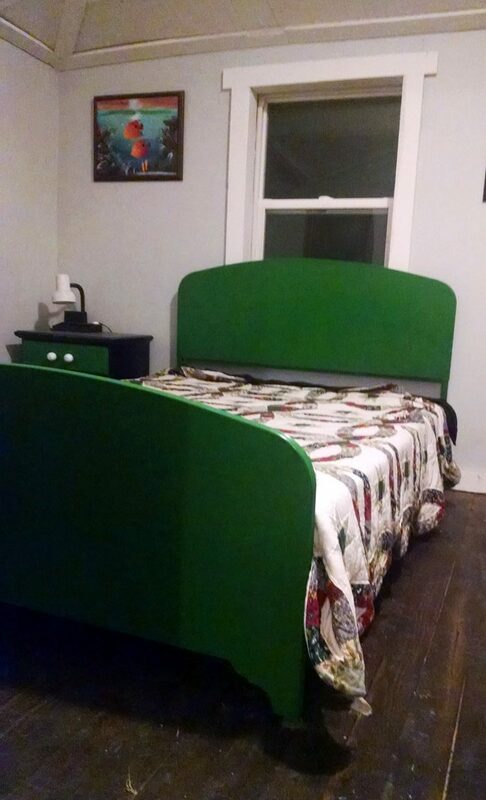 Once the bed was painted it was just screaming for something special, so I got online and went looking for a decal. This is the one I found on Amazon and it was only $11! 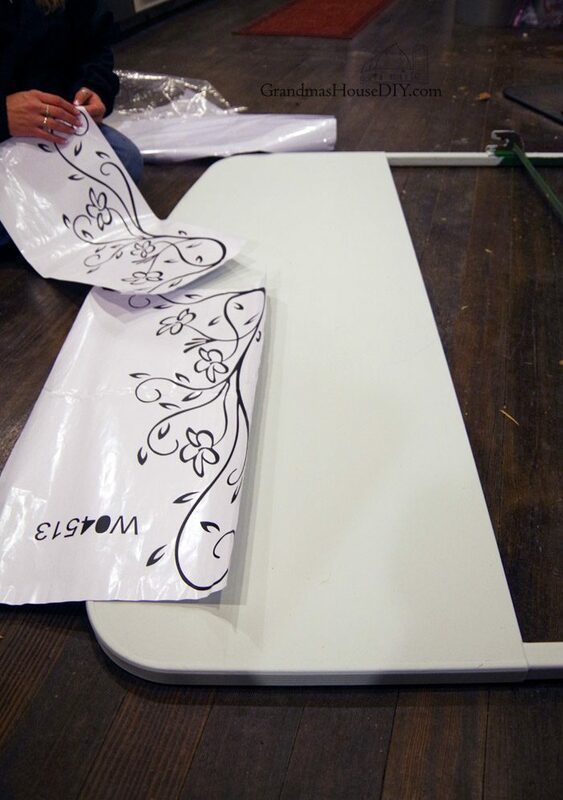 At first I had planned on either making my own stencil or purchasing one but once I saw how inexpensive the wall decals were well, it was pretty obvious what route I needed to head in. My best friend (and cousin) had some experience using them so she helped me put it on (*waves* thanks Rachie!) From there I dressed the bed up with (of course) one of my grandma’s quilts. The headboard turned out great! I can’t wait for the full reveal. Stay warm …. spring is coming. Thank you so much Sandra! Have a great week! Bravo! Love the new look and the decal was just what it needed! Thank you so much Ann! Have a great week! Thank you Barbara! Have a great week! Thank you! I happened to have light gray paint on hand lol so much of my “creativity” is just based on what I have so I don’t need to buy thing! Thanks for coming by! That desk transformation will come out Friday of next week the quote is: “Life isn’t about waiting for the storm to pass, it’s learning to Dance in the Rain” Thanks for coming by, have a great week! Way more restful without the green frame. Looking forward to seeing what you will show next. 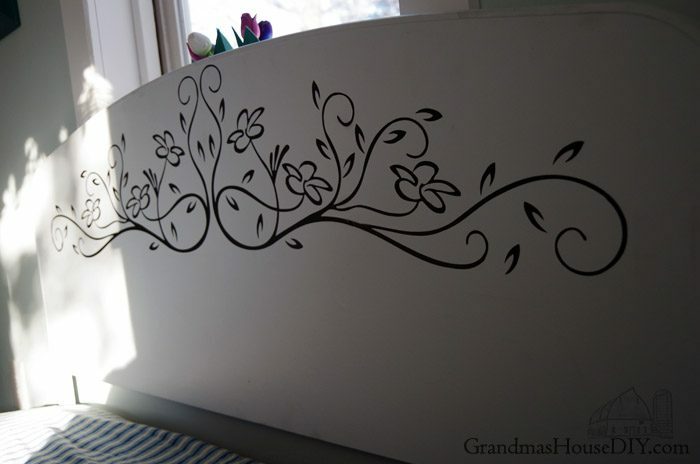 The decal you added to the headboard is beautiful. Stay cozy. 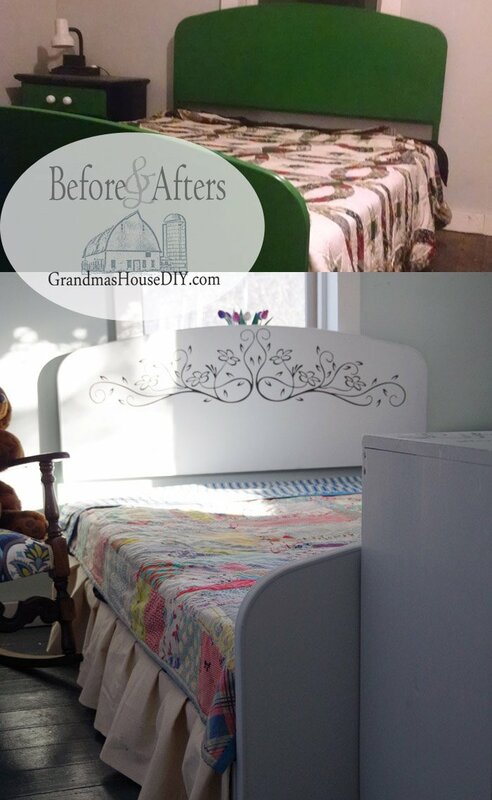 I love how you transformed the bed! It looks beautiful! Oh wow! What a transformation. I love the new look for the guest room. I LOVE it! You are amazing! It’s amazing what can happen to the look, by just changing the color! Thanks so much Natalie, I really love this bed now! Love this transformation! Thanks for sharing with us at #HomeMattersParty! Have a great weekend! oh that looks truly beautiful and what a wonderful job you did! Thanks so much for sharing with us at #BloggersPitStop and have a great week. How pretty! I don’t blame you…in my house that green would have to go too. Loving the look now, and lucky you to inherit such a pretty quilt. The stencil you chose is perfect for it. Wow, that turned out very, very nice! And the quilt on top: beautiful! You did such a nice job on the headboard. It looks so pretty now. 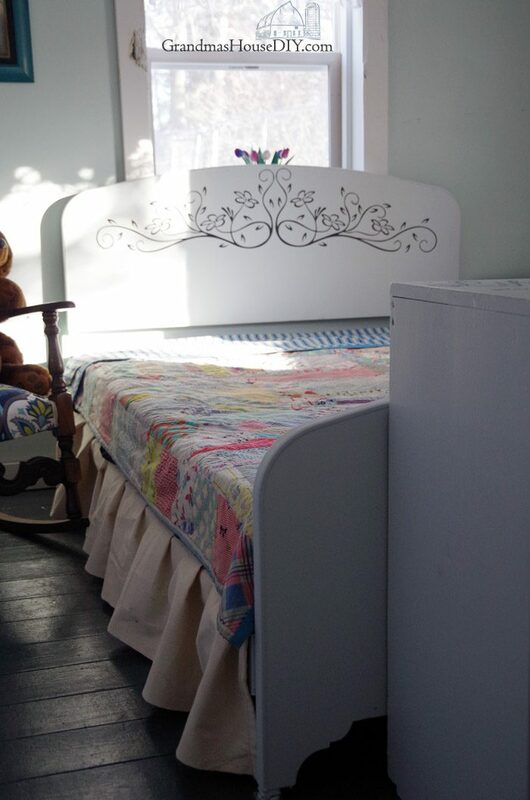 I love the quilt and of course, anything with dropcloth is great. Yup that green was ROUGH! lol, I was so glad to change it! I love this bed again now! Have a great weekend! Fantastic makeover! Thanks for sharing at Home Sweet Home! Really turned out cute! Thanks for sharing with SYC. I love the makeover of the bed! Thanks for sharing at Party in Your PJs! We recently painted several rooms in our house, and I felt the same way about getting rid of the old color! A fresh coat of paint is so nice whether painting walls or furniture. I’m visiting from Thrifty Thursday Link Up and followed you on FB and Pinterest. Blessings! Kristin, it is really amazing what paint can do! Thanks so much for coming by and commenting! It looks amazing….so peaceful!!! You did a great job. I also love the quilt and all of the pretty fabrics in it. Did you make the quilt or is it an antique? 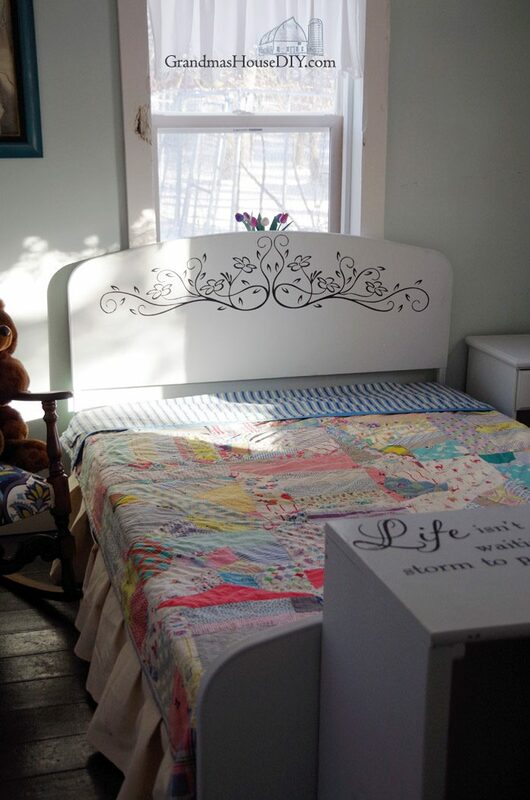 Such a pretty bed, quilt, and room! Thank you Laura, my Grandma made the quilt MANY years ago! Have a great weekend!